Is the Fate of Cuba Tied to Castro's Illness? Cuban President Fidel Castro, hospitalized after surgery for abdominal bleeding, temporarily handed over control of the communist country Monday night to his brother Raul. It's the first time in Castro's 50-year rule that he's let go of authority, even for a short time. 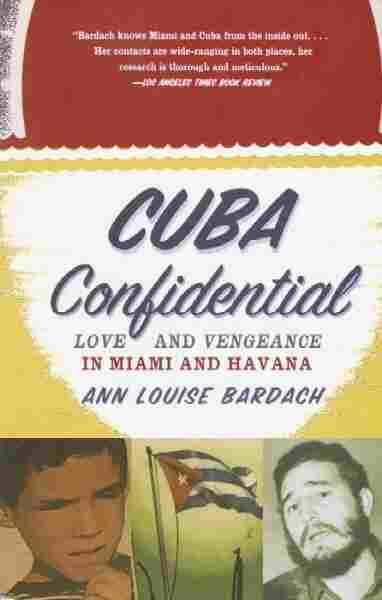 Ann Louise Bardach, author of Cuba Confidential: Love and Vengeance in Miami and Havana, talks with Alex Chadwick about what happens next. Is the Fate of Cuba Tied to Castro's Illness? Cuban President Fidel Castro, hospitalized after surgery for abdominal bleeding, temporarily handed over control of the communist country Monday night to his brother Raul. It's the first time in Castro's 50-year rule that he's let go of authority, even for a short time. Ann Louise Bardach, author of Cuba Confidential: Love and Vengeance in Miami and Havana, talks with Alex Chadwick about what happens next. And I'm Madeleine Brand. Coming up, Lebanon's national library struggles to preserve its collection. CHADWICK: First, Cuba is living through its first day in 47 years without Fidel Castro as boss. Yesterday, the Cuban government announced Fidel is recovering from abdominal surgery and has turned over power to his brother, Raul. CHADWICK: There's intense speculation about the future in Cuba, and in the large exile community in Florida. We'll hear from Miami in a moment. But we begin our coverage with Ann Louise Bardach. She's a journalist and author of Cuba Confidential: Love and Vengeance in Miami and Havana. Annie, welcome back to the program. And what have you heard from inside Cuba? Ms. ANN LOUISE BARDACH (Author): What I'm hearing is that the surgery - contrary to what has been reported - was not yesterday. The surgery was on the 27th. As you know, he was in Argentina at a summit. He gave a three-hour rousing speech. He was the normal Fidel Castro that we've become accustomed to, but he did return to Havana the worse for wear, and he had the surgery soon after on the 27th is what I was told. CHADWICK: Let me ask you this - because all we have so far is this announcement from the Cuban government. How do you know what to believe in Cuba? Ms. BARDACH: Generally speaking, I would say that you have to take the government news and the government press releases with a large grain of salt. I spoke to somebody who had access to somebody very close to him in the Politburo - a particular person in the Politburo - and they said the surgery was in fact on the 27th. CHADWICK: What about the questions of succession? I read news reports from Miami that some people in the exile community there think that Fidel's brother, Raul, would actually be worse - that he'd be more harsh. Ms. BARDACH: That's the traditional thinking about Raul Castro. I personally think that it's possible that Raul Castro would be more pragmatic. There is the idea that he's the bad cop to Fidel Castro being the good cop. I think if you look in the last 10 years of what's happened in Cuba, the parts of the government that have been more hospitable to reform have actually been led by Raul Castro. Now, he does have another kind of tyrannical side. We have seen this historically, where he's made some very aggressive moves to eliminate his enemies or his brother's enemies. But we've also seen him much more pragmatic, as I said. He's the man who started the farmer's market, and he has talked about admiring the Chinese model for socialism, which is certainly - virtually a capitalist system. CHADWICK: Do you have any sense that the stability of Cuba would be in some doubt if Fidel is incapacitated? Ms. BARDACH: I think that this is a huge earthquake for Cubans both in Cuba and in Miami and for U.S. policy. However, this transition has been worked on and fine-tuned now for several years. Castro is very mindful of these issues. He's very concerned about his legacy, and they've had several protocols and plans in place for several years. I remember four years ago hearing about a plan to make sure that there would not be a coup in the event of his death. And again, as far back as several years ago, it was arranged that his brother would step in. And none of the cabinet ministers or members of the Politburo would take power. I think that the transition will be more orderly than most people think, but it's still quite an earthquake for Cubans there and Cubans here. CHADWICK: Ann Louise Bardach is author of Cuba Confidential. She's currently editing a collection of Fidel Castro's letters from prison to be published early next year. Ann Bardach, thank you for joining us on DAY TO DAY. Ms. BARDACH: Thank you for having me, Alex. Q&A: Who Will Succeed Castro? After 47 years as the leader of Cuba, Fidel Castro has shifted power, temporarily, to his brother Raul as he undergoes surgery for gastrointestinal bleeding. But even before his most-recent illness, succession had been a topic of open discussion in Cuba. Five years ago, Castro fainted during a speech in Cuba. In 2004, he fell from a platform, shattered his knee, and broke his arm. Some suspect that Castro had a series of small strokes recently. Others believe he suffers from Parkinson's disease. Many believe that a campaign to prepare the country for the inevitable is under way. But Raul Castro is himself 75 years old and unlikely to command the same kind of loyalty. Who else is in a position to assume power? Tom Gjelten explains. What's in place for Castro's succession? The Cuban government is in a terrible position with respect to planning for the succession. For all the time that Fidel Castro has been in power, he has really resisted sharing authority with everyone. He has insisted on making all key decisions himself. And as a result of that, you've had a very centralized system of government, with no local leadership. You don't get people accustomed to taking responsibility themselves, making their own decisions. The result of which is that there really isn't much authority in Cuba outside the person of Fidel Castro. He can make announcements or pronouncements right now about who's designated to succeed him, but almost everyone who's in a position of power in Cuba -- whether it's Raul, or whether it's any of these other second-tier people -- owe their position in power to Fidel. Once he is gone, it could be a complete chaos. It could be a vacuum of authority. Everything that Fidel said about what he wants to follow after him, in a sense, goes out the window, because he's not there to make sure it does. Who would control the army? Who would control the police? Well, Raul Castro would definitely control the army. He also has Ministry of Interior forces under his command, as well. And this is the one fact, I think, that we can rely on, at least in the short run. 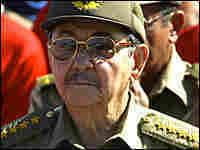 Raul has been defense minister, he's been commander in chief of the Cuban armed forces from the very beginning. He does have great loyalty among the Cuban armed forces. What about that second tier of leaders? Who are they? What positions do they hold? Carlos Lage,, who's secretary of the Council of Ministers, is the ranking technocrat, as it were, in the top Cuban leadership. He's 54 years old, he's been in charge of the Cuban economy. He is certainly competent and has a track record of achievement. Felipe Perez Roque is the foreign minister. He's very young — just 41 — and was born after the revolution. He came to power as Fidel's personal secretary at the age of 21. He is someone who completely owes his position in Cuba right now to his closeness to Fidel Castro. And I think he's someone who's mentioned as a logical person to play a leadership role in the days after Fidel is gone. But how can someone who doesn't really have any authority, outside of what Fidel has bestowed on him, have much of an independent base to operate? I think that's a really important question. Ricardo Alarcon, who is 69 years old, is familiar to Americans because he speaks English and is kind of the designated spokesman for the Cuban government in dealing with the foreign press, and in receiving U.S. and foreign delegations in Havana. He represented Cuba at the United Nations, was at one time Cuba's foreign minister. So a very familiar face, both to the U.S. public and to the U.S. government. But also very closely allied with Fidel and has really served as Fidel's spokesman in the international arena. Once Fidel is gone, there will be a battle to control not only the government, but also the news media and various forms of public communication. So I think that even if Raul is alive, you could still see some pretty serious competition that might very well be reflected in the public media.